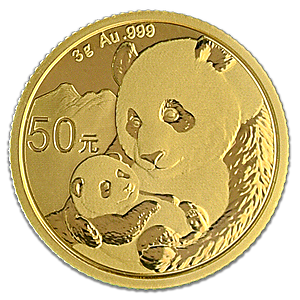 This 3 gram Chinese Gold Panda bullion coin is minted from .999 fine gold and is issued by the Chinese central bank on behalf of the Chinese State. Chinese gold Panda coins have been minted since 1982 and 2019 marks the coin's 37th year of issue. Each year the panda design on the Chinese gold Pand coins changes and for 2019, the coin's designers have created an endearing image of a mother panda holding her panda cub in a loving embrace. 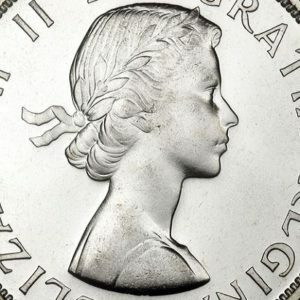 The obverse of the coin, which contains consistent imagery across years, features a depiction of the Temple of Heaven in Beijing encircled by the words "People's Republic of China" in Chinese and the year of the coin's issue, 2019. As an affordable and attractive bullion coin choice for investors and collectors, the 3 gram Chinese gold Panda bullion coin is a logical choice due to its worldwide recognition and government guarantee of authenticity.